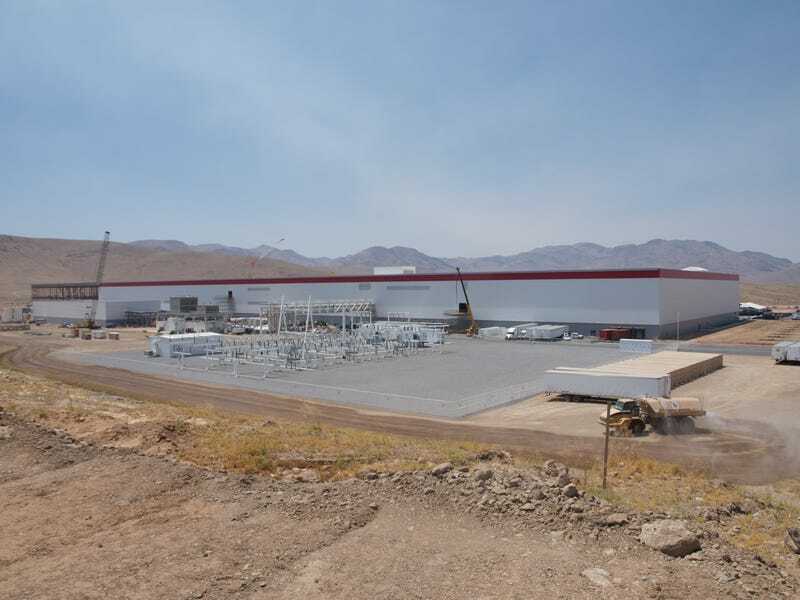 I never understood why Tesla insisted on calling its new battery factory a “Gigafactory.” It’s just a factory, after all, and we already have a word in English for that—“factory.” But then I saw it up close, and the enormity of it all is mind-boggling. When finished, it will be the largest factory in the entire world and the the biggest building in the world by footprint. Here’s why Tesla needs it. 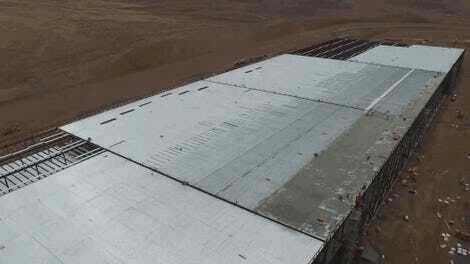 Tesla is betting its entire future, in large part, on Gigafactory 1. It will churn out the batteries necessary for the Tesla Model 3, which is the car that’s supposed to make or break the company, and for which Tesla already has hundreds of thousands of orders despite first deliveries still being more than a year away. But if there are no batteries, there will be no car. And with no cars, there won’t be much of a company left to speak of. And even then, there’s an enormous question raised here: Tesla’s making thousands of cars already, so why does it need the largest factory in the world just to build a few more? The reason is that Tesla’s planned annual production of cars, powered by lithium-ion batteries much like the ones in your laptop and cell phone, will exceed the entire global production of batteries in short order. With a problem like that, the only solution is to build a new battery factory. A big one. Production of battery cells starts in a few weeks, but the building itself isn’t even finished yet. It actually won’t be finished for a long time. As it stands, only 14 percent of the work is complete, but already it contains 1.9 million square feet of floor space, on an 800,000 square foot footprint. When it’s done, it’s supposed to contain over 10 million square feet of floor space. Some battery production has actually already started, in the form of Tesla Powerwalls and Powerpacks, which are meant for stationary energy storage for a home or a business. A Powerwall is a bit like an enormous battery hanging out on your wall for whenever you need it, for power outages or even just smoothing out energy consumption. One Powerpack, in turn, is 16 Powerwall batteries in a stack, and the energy stored inside can power a typical American home for three days, Tesla says. When production is fully up and running at the 14 percent that’s been completed,which is planned for 2018, it will make batteries for up to 500,000 cars a year. And 500,000 cars will require more batteries than the entire global production of batteries in 2014. Each small battery cell—which they wouldn’t let us take photos of—looks a lot like a shiny metal shotgun shell. But at the Gigafactory, two different ideas are constantly competing for space. On the one hand, production needs to be up and running as soon as possible. On the other, Tesla needs as much capacity as possible. Because of that, there are odd features that you don’t find on many buildings. Most of the exterior walls, for example, are temporary. The final building, with a completion date that is still to be determined, will make batteries for 1.5 million cars. As you’re reading this, on a hot late July day of 2016, more than 800 construction workers are scurrying in two daily shifts to get everything ready. Even with all that, the sheer size of the thing is hard to convey in words. On what will soon be the main production floor, equipment seems to just stretch on forever. There was much they wouldn’t allow us to take photos of, including 38-foot high battery production machines which seemed to stretch for nearly 300 feet in length, though Tesla refused to tell us how large they actually were. Everything seems to smell of paint, glue, or epoxy. There are massive dry rooms, intended to keep the humidity down to less than one percent. Storage facilities with hundreds if not thousands of racks await battery packs and an army of robots to create and move it all. And all of it, just to build one car. For now. Tesla’s second Master Plan hints at pickup trucks, semis, and a full range of vehicles. If all of it works. There’s still plenty stacked against it, and plenty of things that could go very wrong. What if people start canceling their Model 3 orders? What if people stop buying Tesla’s already existing cars, the Model S and Model X? What if the entire financial world suddenly realizes the even bigger chutzpah needed to have a start-up, and one that still only employs 15,000 people, build the world’s biggest factory? What if the suppliers can’t deliver? What if the Model 3 is beset by production slip-ups and delays, as its predecessors were? What if it’s just not any good? What if it’s all just a huge gamble, and it’s more risky than anyone is willing to admit? There’s an endless list of questions that could be asked. But for now at Tesla, the only answer is full speed ahead.